This low loft bed with tons of storage is sure to be a hit in a girl's bedroom. Its crisp white finish fits any decor. At the base, two loft storage drawer units and one loft bookcase with built-in ladder offer an easy way to stay organized and display belongings. Several configuration options available. The Lulu Twin Loft Bed w/ Loft Drawer Storage by Signature Design by Ashley at Household Furniture in the El Paso & Horizon City, TX area. Product availability may vary. Contact us for the most current availability on this product. 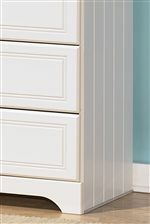 ASHL-B102-17 Loft Bookcase 1 46.75" 14.76" 29.78"
ASHL-ASHL-B100-11 Twin Roll Slat 1 38.43" 70.79" 0.75"
ASHL-B102-19 Loft Drawer Storage 2 30.71" 15.83" 29.61"
ASHL-B102-68T Twin Loft Bed 1 77" 42" 46"
The Lulu collection is a great option if you are looking for Cottage furniture in the El Paso & Horizon City, TX area. Browse other items in the Lulu collection from Household Furniture in the El Paso & Horizon City, TX area.